Yes, it’s the weekend! It’s also the last day of January 2014! Did this month fly by as quickly for you as it did for me? Many of you probably made New Year’s Resolutions that have already fallen by the way-side. A lot of times this happens because we loose the motivation to stick with the resolutions. To help you out, I am sharing a page from my Success Kit Workbook (part of my new Empowerment Speaker Series!!!!!!!). Take some time this weekend to refuel yourself with some inspirational quotes to help you keep pressing forward with your goals. 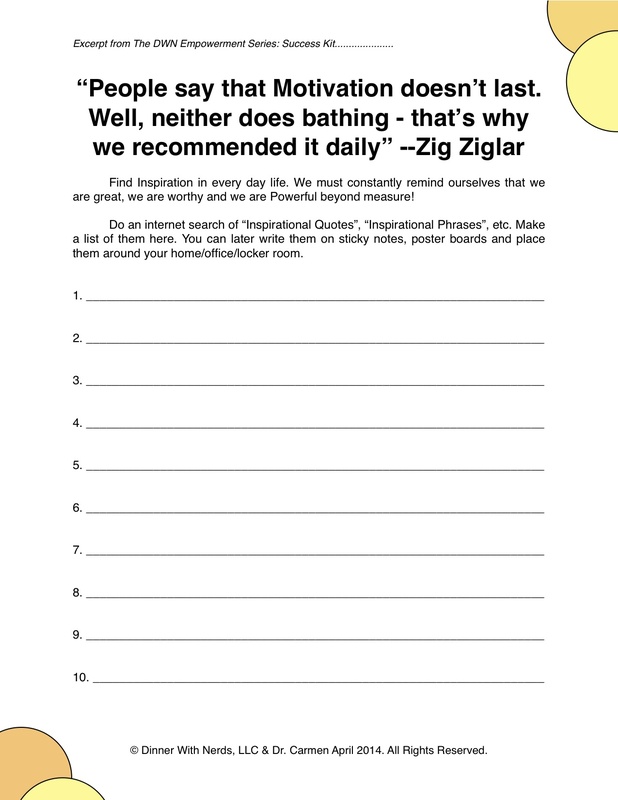 Do an internet search of great inspirational quotes and write them down on the worksheet. Hang it up on your Fridge, Bathroom Mirror, in your office, etc and read it often. You’ll be surprised at how many of these you begin to memorize. Use them to motivate yourself when your determination starts to fade. Enjoy and have a great weekend! This is the very first Blog post on my new site, DrCarmenApril.com ! Because I maintain a website for my medical practice, my Food Blog, along with several social media accounts, I wanted to create a “home base” for them all. It is here that I will also share my ideas and opinions to encourage others and that have absolutely nothing to do with Feet OR Food…HaHa! I’ve had the idea to create this site for over a year and between running a practice, staying busy with my food blog and serving my community, I had a hard time just “getting started” on this new site. I even found myself getting frustrated because it was constantly on my “To-Do list” since I wasn’t being proactive in getting it done. Here’s a little FYI about me……… I Looooooove to scratch items off my To-Do List. It’s one of the things that brings me joy each and every day. I’m totally being serious when I say this! I get so much satisfaction from checking off my list and throwing it away at the end of the day…..Yes! I don’t know about you, but this is sometimes the thought process in my head when God tells me to “just go and do it” –> ‘What? God, how are you gonna tell me something this GRAND and then just stop talking? Are you gonna tell me what to do next? How am I gonna do this? How long is this gonna take? Where am I gonna get the money? I don’t know if I can do all of that…….” Does this sound familiar to anyone else???? Caring is sharing so please, if my posts resonate with you in any form or fashion, leave a comment, share the post via social media or email, send me an email, send a dancing telegram (lol) or something to let me know what you think. I’d love to hear from you!